Springtime is finally here, as of today, May 2, 2012, Finca La Emperatriz is a buzz with the sounds of the tractors preparing the land for the next generation of vines that will create future wine for Bodegas La Emperatriz in the years to come. Today, Bodegas La Emperatriz has planted six hectares (14.82 acres) of new vines in the Finca La Emperatriz Estate located in Rioja Alta. There will be three hectares or 7. 42 acres of Maturana Tinta de Navarrete and another 3 hectares of Tempranillo rootstock. There will be approximately 3,077 vines per hectare planted today. The process of planting a vineyard generally starts in La Rioja in spring. Due to the recent and much needed rain showers, the land was already soft and easy to plough. At Finca La Emperatriz, the land is ploughed or turned up with a tractor. Once this is completed, the land is ready for the second tractor carrying behind it a 2 seater machine that allows a person to hand place the rootstock into the rotating machine to place it in the ground. Once this is done, then two wheels on each side of the rootstock bring the dirt together and bury the rootstock. The rootstock with the grafted area sticks out of the ground so that the vine can start to take root and grow. Below you will see the video that shows how it was done today. Maturana Tinta de Navarrete is a one of the new varieties approved by the Control Board of the Rioja Designation of Origin in May 2009. Maturana Tinta is a native Riojan variety that was rescued from extinction by research done by the University of La Rioja and the Center of Investigation and Agrarian Development (CIDA-Centro de Investigación y Desarrollo Agrario). Maturana Tinta is known for its small compact clusters of small berries. It has a high color intensity and anthocyanin content with high acidity and medium alcohol content. While a common grape used for blending, it can also be made into a mono-varietal wine that is a dark purple color with typical varietal aromas of black berries, green pepper (pyrazines), licorice, balsamic and spice notes. Due to its notable acidity it provides a very well-structured mouth and persistence. It is also this characteristic that makes this an ideal wine to be aged. Tempranillo is the most widely planted variety in Spain and in la Rioja, where it is used due to its proven ability to age. In La Rioja, It is the wine region’s best known grape. It occupies more than 75% of the region’s vineyards and it is very versatile variety that has a good balance of alcohol content, color and acidity, and an honest, smooth, fruity mouth feel that turns velvety as it ages. 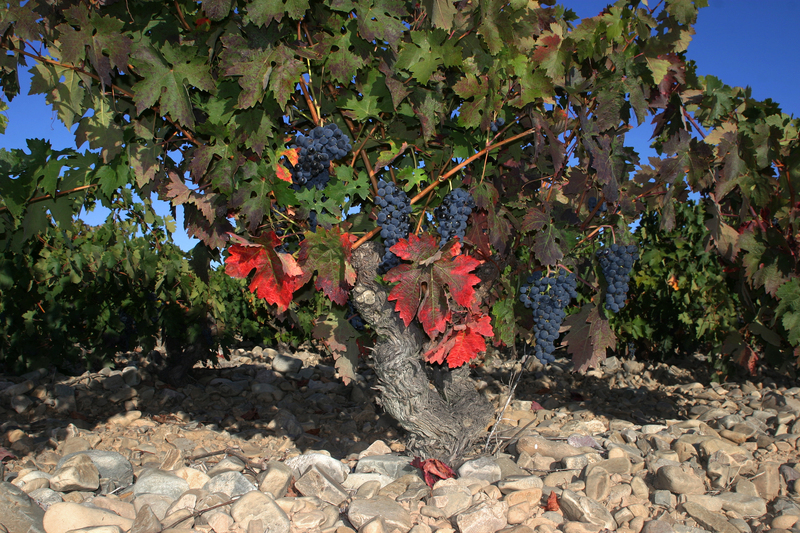 Tempranillo is found as the predominant grape variety used in Crianzas and Reservas of La Rioja. This entry was posted in Spanish Experiences, Understanding the Vines and tagged april hennig, April Yap Hennig, Finca La Emperatriz, how vines are planted, La Emperatriz, La Rioja, Plantation, Spanish Experiences, spanish winery, Spanish Wines, springtime, Vineyard. Bookmark the permalink.